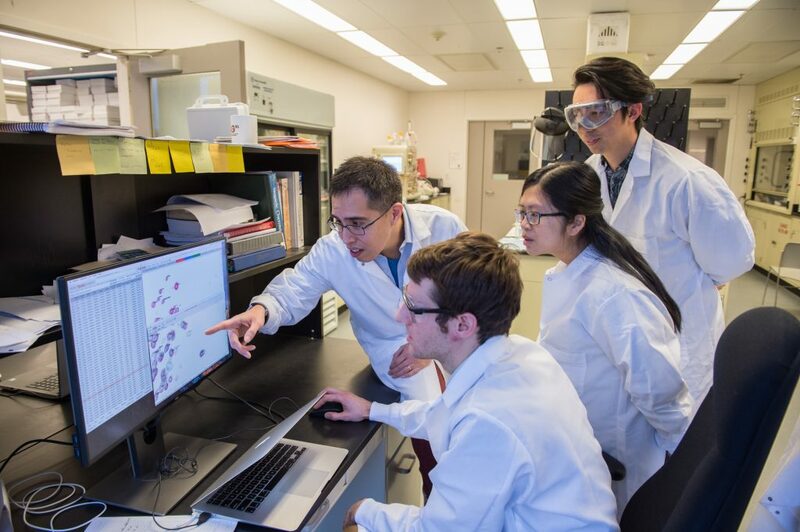 Carlos Castañeda (left), assistant professor of biology and chemistry, in his lab with (from left) graduate student Brian Martyniak, postdoc Thuy Dao and grad student Tongyin Zheng. Carlos Castañeda, assistant professor of biology and chemistry in the College of Arts and Sciences, is the principal investigator on a pair of research projects studying the function of cellular proteins called ubiquilins and their ability to form protein-containing droplets inside neurons. A better understanding of these proteins may lead to new treatments for various neurological disorders such as amyotrophic lateral sclerosis (ALS) disease. The first project is supported by a five-year, $830,000 National Science Foundation CAREER grant; it has both research and educational components and is focused on the full ubiquilin protein family. The second project—funded by a three-year, $300,000 grant from the ALS Association—concentrates solely on the ALS-linked protein ubiquilin-2. For the NSF CAREER project, Castañeda and his lab are working with Dr. Heidi Hehnly from SUNY Upstate Medical University and Susan Krueger, research physicist in the Center for Neutron Research at the National Institute of Standards and Technology in Gaithersburg, Maryland. The ALS Association project involves Hehnly and Dr. J. Paul Taylor at St. Jude’s Children’s Research Hospital in Memphis, Tennessee. The ALS project has been spearheaded by postdoctoral scholar Thuy Dao. Also involved in the projects are two chemistry graduate students working in Castañeda’s lab, Brian Martyniak and Yiran Yang. 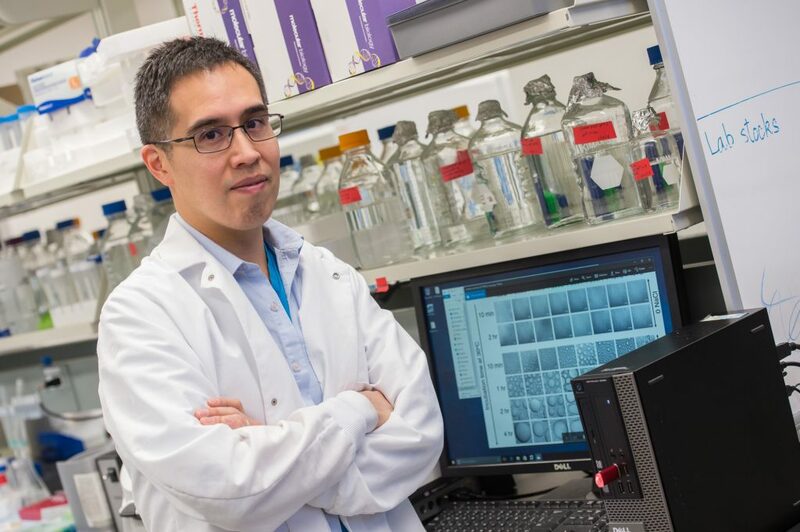 “Our lab has discovered that ubiquilin-2, a protein that is part of the cell’s protein quality control machinery, is able to reversibly form liquid-like droplets under physiological conditions,” Castañeda says. “The process is called liquid-liquid phase separation, and it is a common physical phenomenon for many ALS-linked proteins. The NSF CAREER grant focuses on finding the molecular basis for droplet formation and also determining the structure of ubiquilin-2 droplets using experimental and computational techniques, including nuclear magnetic resonance (NMR), small angle scattering and microscopy. The ALS Association project focuses on understanding the effects of ALS-linked disease mutations on ubiquilin-2 function in the test tube and in cells. “We aim to figure out what causes these protein-containing droplets to morph into aggregates characteristic of neurological disorders like ALS,” Castañeda says. “We have hypothesized that ubiquilin-2 is integral to the machinery that regulates droplet assembly/disassembly and, hence, disease-linked neural inclusions. We hope to discover the physical basis by which ubiquilin-2 self-assembles into these protein-containing droplets. As their research progresses, Castañeda and his colleagues will be sharing their knowledge in a series of mini-workshops for high school participants in the Summer Science Institute (SSI) at Syracuse University. SSI is a two-week summer science immersion program open to high school students from the Solvay Union Free School District. The NSF CAREER grant is funding the mini-workshops, one per year for five years. Castañeda and SSI coordinator Melody Sweet, assistant professor of biology in the College of Arts and Sciences, will design the sessions, with the students involved in experimentation about three hours each day over two to three days. Two of Castañeda’s graduate students will serve as workshop leaders. “The students will learn protein purification and analyze how manipulation of physical and chemical parameters –e.g., changes in pH and temperature—promote droplet formation of our protein,” Castañeda says. As many as 75 to 100 Solvay students are anticipated to take part in the mini-workshops over the course of the five years.